Singaporeans start shopping for 11.11 as early as 7PM, few hours before the actual event. By analysing the online traffic of shoppers a day before 11.11, it showed a consistent trend from 9AM before increase significantly 7PM onwards. A slight decrease is observed at 11PM but it soon rose sharply in one hour, reaching 109% more traffic compared to 5 hours ago. It appeared that Singaporeans were already browsing shopping site before 12AM, where most deals occurred. This might be highly driven by the new and many promotion tactics introduced by e-Commerce merchants this year. One of the most popular methods is shoppers are encouraged to add the products they wished to buy to their online shopping carts before the 11.11 sales start. This is to ensure they may complete their purchases as soon as possible. For example, Lazada listed out the prices of products that will be on sales before the discounted price is activated at 12AM. This helped shoppers to better prepare in getting the best deals. Various coupons were also available to be grab before the sales start. Besides that, Singaporeans showed a much higher interest for 11.11 this year. By comparing the growth of the online traffic from 7PM to 12AM between both years, the hourly traffic grew at a higher rate this year. It recorded a very steep rise in 5 hours, whereas it only grew gradually for each hour last year. This year, most e-Commerce merchants in Singapore can be seen to be putting more efforts to upscale their 11.11 sales. The promotions offered are comprised of few different types. There are “traditional” deals, such as coupons and products discounts, and engaging offers, such as in-app games on Shopee and live streaming. Along with that, they also offered educational tips for shoppers. Merchants can be seen to share more specific tips and tricks to educate shoppers on how to make the best out of all offers. 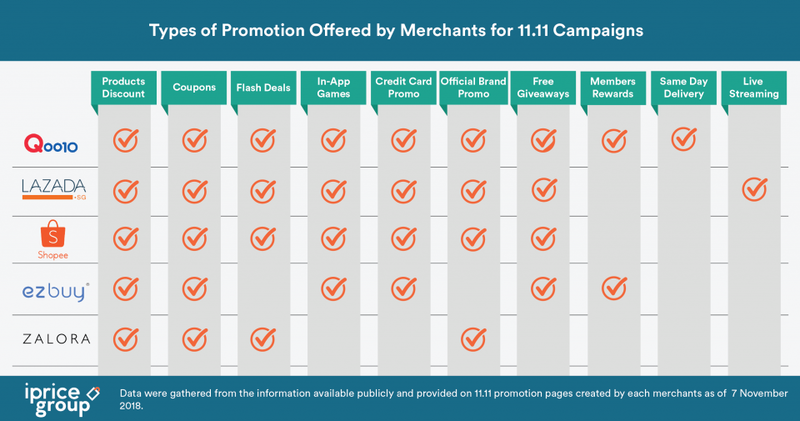 Tricks such as adding products to the cart, flash deals notification reminders, a complete guide to all the promotions available, etc.. help in contributing to the higher interest for 11.11 this year. It brings significant values to the whole online shopping experience for both regular and new online shoppers in Singapore. 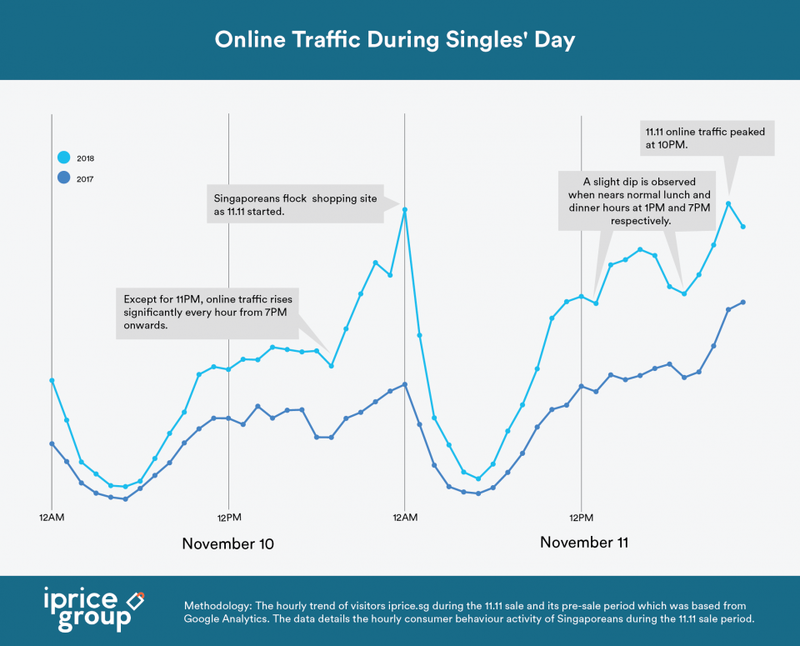 During the Singles’ Day, the online traffic also appeared to correlate with the types of promotion by merchants. Shoppers can be seen actively browsing shopping site at 12AM. E-Commerce players such as Lazada, Shopee and more introduced special deals as 11.11 kicked off at 12AM. Various promotions are held between 12AM and 2AM to encourage shoppers to purchase more within the golden hour. It then decreased late at night at the time that normal sleeping hours occur. It increased gradually again at 9AM. A slight dip is observed when nears normal lunch and dinner hours at 1PM and 7PM respectively. This signifies the average hour Singaporeans had their meals for the day. The online traffic for Singles’ Day reached its peak at 10PM. The traffic grew significantly starting at 7PM until 10PM. This indicated to us that many shoppers flock shopping site at the end of the day for last minute deals and shopping. The same trend can be observed from the previous year where traffic grew exponentially from 8PM, and eventually reaching the peak at 11PM. 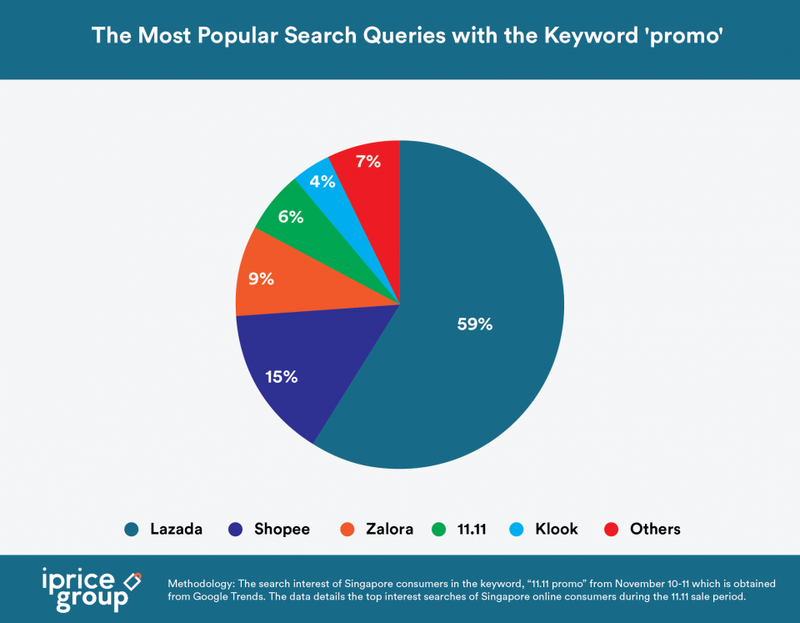 By analysing keywords related to “11.11 promo” using Google Trends, Lazada took up 59% of the most popular queries. Some of the most popular queries used are “Lazada 11.11”, “Lazada 11.11 promo code”, “Lazada 11.11 sale” and more. Shopee took the second spot with 15%. Shoppers are searching for “Shopee 11.11”, “Shopee 11.11 promo code” and “Shopee promo code”. Zalora and 11.11 also made it to the most popular search queries. Klook, the only travel-focused site in the list, placed 5th with queries such as “Klook promo code” and “Klook 11.11”. 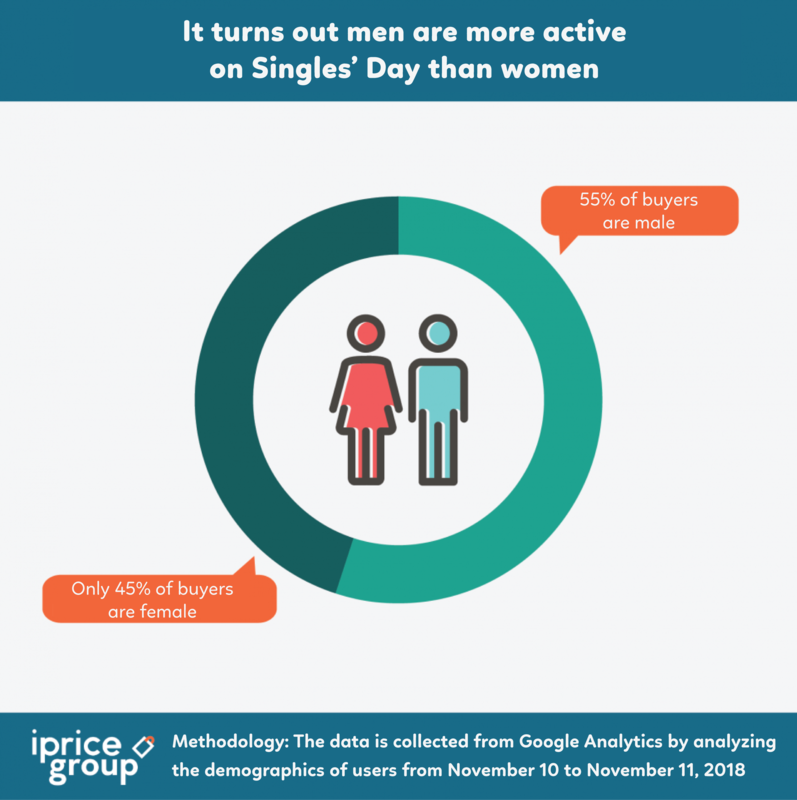 The analyzer team of iPrice Group chose to compare the traffic from users of iPrice Indonesia at Singles’ Day with the traffic occured due to the Singles’ Day promo campaign that began on October 25, 2018. That way, the data obtained was not affected by promotions made by any e-Commerce party. According to the data obtained, traffic on November 10 has increased since 10PM compared to the previous month. Normal day traffic usually decreases from 9PM to 4AM, but data on November 10 shows that traffic starts to rise from 10PM and soars at 11AM, showing an increase of 50% compared to normal days. 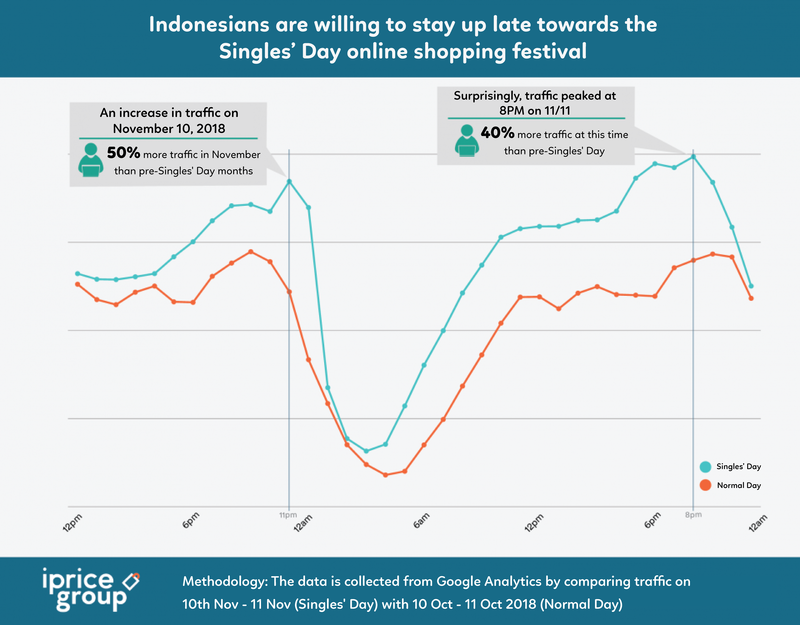 With this data, we can assume that Indonesians show their enthusiasm for the Singles’ Day, as evidenced by the surge in online traffic, several hours before the Singles’ Day begins (00.00 a.m.). Since many e-Commerce users are making blunt sales that start right at 12AM, it is strange to see the peak of Singles’ Day traffic not at 12AM, but at 8PM, with a difference of 40% compared to traffic on normal selling days. This could be due to the many impromptu promos offered by various e-Commerce platforms in the last hours of Singles’ Day, which provoked enthusiasm from discount hunters to simply check or wait for them to happen. 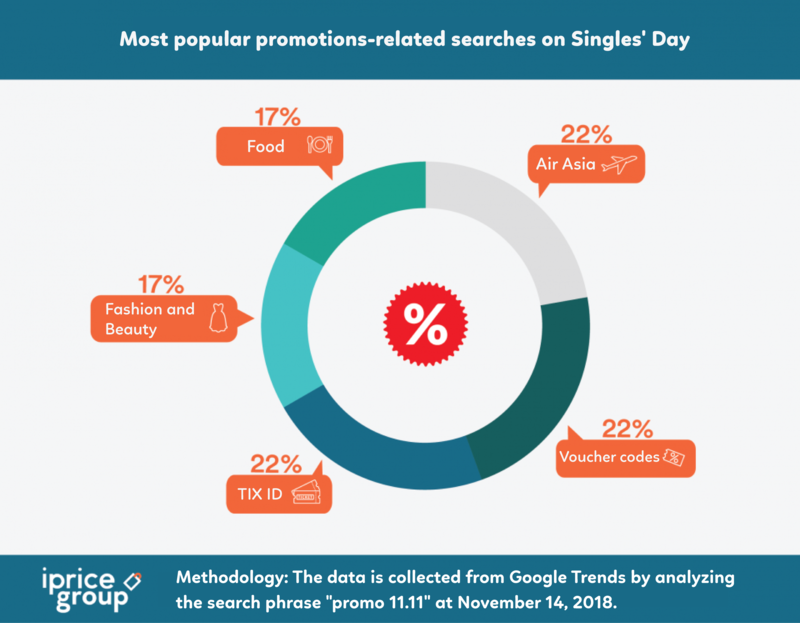 On this year’s Singles’ Day, many are looking for Air Asia airline promos rather than promotions from other lines of products. This is evidenced by the surge in searches with keywords “Air Asia promos”, “Air Asia 11.11”, “Air Asia promo 2018”, and “Air Asia”. Although the percentage of searches for e-voucher codes and TIX ID promos also sit at 22%, the biggest increase among those still belong to Air Asia airline promos. This could be due to the free seat coupons offered by Air Asia. Air Asia provides 5 million of these free seats to celebrate Harbolnas – Indonesia’s National Online Shopping Day – which lasts for one week starting from November 11, 2018. Up until now, there are still many who label women solely as “shoppers”. This time around things are different in Indonesia. Statistics captured on the demographics of buyers show that the percentage of men who shop exceeds women. This proves that the field of online shopping is not always dominated by women, but also attracts the likes of men. This could be due to the promotion of many electronic items that are mostly sought after by men, such as laptops, computer equipments, video games, cellphones, and various other electronic categories. In Thailand, Lazada hosted a massive televised gala with celebrities counting down until the shopping deals began at midnight. The program aired online and on one of Thailand’s most popular television channels. In Singapore, Lazada partnered with Expedia to sponsor a trip to NASA facilities in Florida, in an effort to promote the sales. Vietnam also took its part in the now-international shopping event with much success coming from its largest e-Commerce platforms – Lazada, Shopee & Tiki. ->> [Infographic] The Singles’ Day shopping festival in Vietnam and the impressive records. Lazada worked with many of its existing partners, including P&G, Unilever, L’Oreal and Samsung leading up to the event. But Singles Day wasn’t only limited to Lazada‘s ecosystem – other e-Commerce ventures seized the opportunity. For one, MLAB Holdings, which distributes Sweden-designed Happy Socks into Southeast Asia, ordered 20 to 30 percent more stock in anticipation of Singles Day, according to Mack Chua – the company’s managing director. Chua, who ran a “buy one, get one free” promotion during the event, said he had only been selling on Lazada for several months. Following the event, he told CNBC that he sold fives times the amount of socks than the previous Saturday – but the overall sales actually came in less than what he’d expected. “Sales were okay, but we will consolidate our products for Cyber Monday and Black Friday,” he said. JD.com – Alibaba’s biggest rival in China – announced that it sold $23 billion in goods in its 11-day sales campaign that started on November 1. That is an increase of 26% over 2017. Some analysts believe that other online marketplaces are taking overall market share away from Alibaba as well. For example, Pinduoduo, established in 2015, is a rapidly growing platform that allows users to participate in group buying deals, mostly through internet technology investor Tencent’s WeChat application. Earlier this year, Alibaba cut its sales forecast for the fiscal year ending in March 2019 by roughly 5%, citing the shaky economy and the trade jitters with the United States. Alibaba relies on the flourishing Chinese middle class – 400 million strong and still counting – comprised mostly of people in their 20s and early 30s. This demographic is pulling back on non-essential purchases according to analysts, a fact that could affect Alibaba’s growth. Many U.S. commentators noted the slower growth rate for Alibaba on Singles’ Day this year and are predicting that the holiday may lose some of its appeal in the future. In some news reports, Chinese consumers stated that Singles’ Day discounts this year were not deep enough for them to dive in. Alibaba is big enough to survive a sales decline, and it should continue to diversify now that the Southeast Asia as a whole has become heavily involved. 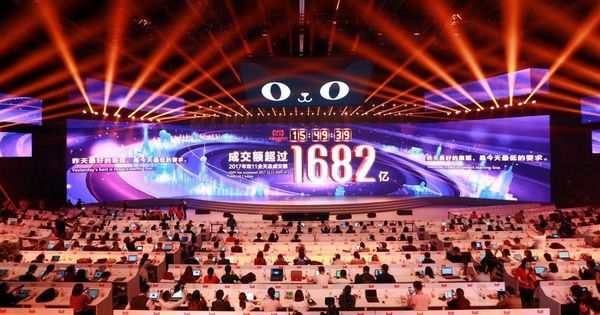 Next year’s Singles’ Day, however, might look different.